Location: Collooney, County Sligo, Ireland. Condition: Restored Castle. Now small family-run hotel. Ownership / Access: Charles and Mary Cooper. 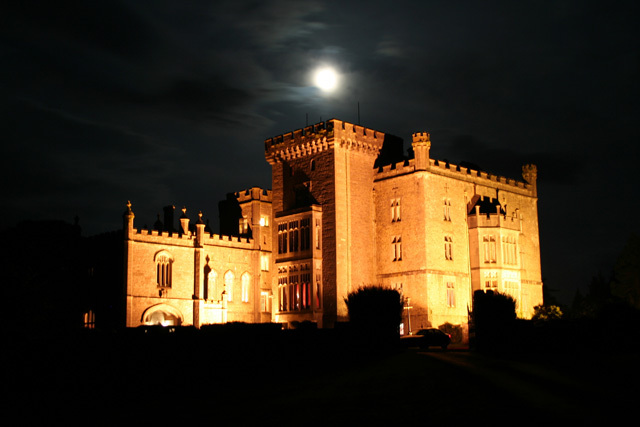 Notes: Markree Castle, in Collooney, County Sligo, Ireland is the ancestral seat of the Cooper family, partially moated by the River Unshin. Today it is a small family-run hotel. Today, Markree Castle operates as a hotel run by Charles and Mary Cooper, the 10th generation of the family to live there. The 300-acre (1.2 km2) estate holds an array of wild life including red squirrels, otters, and kingfishers. The entrance contains a monumental staircase, which leads to a wonderful hall, from where a second staircase in carved wood leads to the 30 guest rooms. On the landing, a huge stained glass window traces the Cooper family tree from Victorian times back to the time of King John. The dining room is decorated in Louis Philippe-style plasterwork.